Here at the Norfolk Royale Hotel we have everything you need to make your conference or corporate event a success. If you are looking for a venue for your business event then the Norfolk Royale is the perfect place. From conferences, to meetings and even business social events we have it all covered. 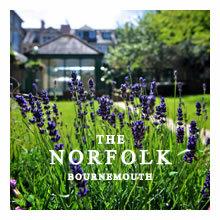 The Norfolk Royale Hotel is Bournemouth’s most central hotel, only a few steps from Bournemouth Square, as well as walking distance to the BIC. We offer Day Delegate packages from just £27.50 per person, as well as 24 Hour Packages from just £130 per person. Day Delegates can enjoy a two course or buffet lunch, two servings of tea, coffee and biscuits, secure underground parking and free WiFi. 24 Hour Delegates also get full use of our leisure facilities, overnight accommodation in a double room, a 3 course dinner and full English breakfast. Our corporate facilities are also available in room hire only rates. We have 6 meeting rooms with capacities from 10 to 120. The hotel benefits from free WiFi throughout. Finally if you are hosting a corporate event with us you can choose to book a private dining suite, or even dine Al Fresco in our beautiful private garden.